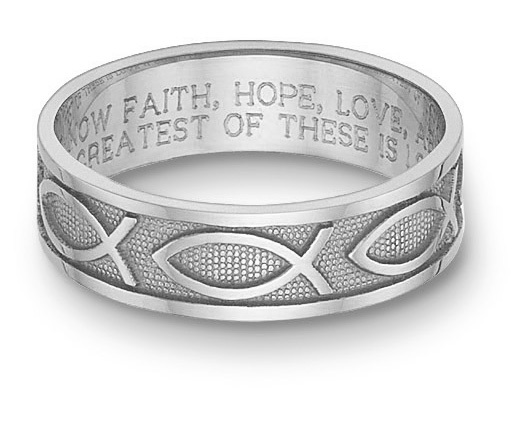 A 14k white gold Ichthus symbol ring with any Bible verse of your choice. Through our unique engraving method, we are able to inscribe the entire passage of a Bible verse on the ring, up to 150 characters (including spacing). Simply enter the Bible verse you would like and we will engrave it on the inside of your ring. There is a sizing space on the back of the ring, so the design does not go all the way around and a small portion of the back is polished, so that you can size your ring in the future if needed. Available in women's size 4.5 - 9. We guarantee our Women's 14K White Gold Ichthus Bible Verse Ring to be high quality, authentic jewelry, as described above.